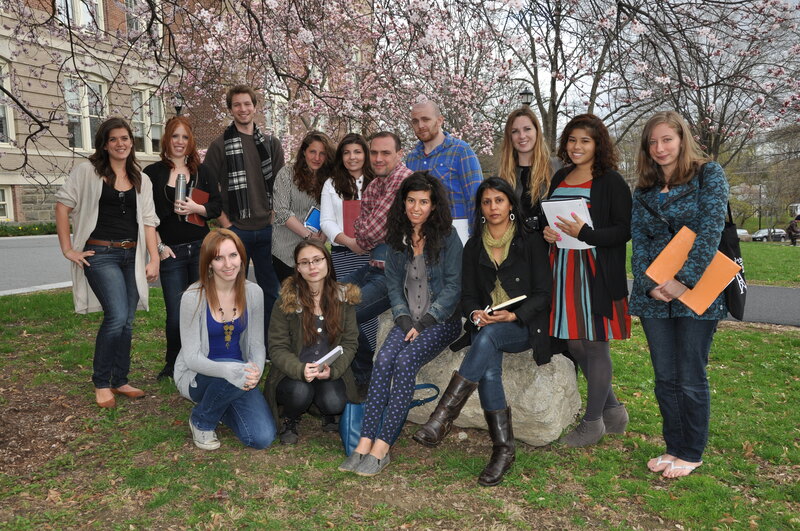 Tick Talk is the result of 14 weeks of collaborative investigative reporting conducted at the State University of New York at New Paltz under the aegis of “Science, environment, and disease: new approaches to science journalism,” a seminar led by science journalist Sonia Shah, the 2014 James H. Ottaway Sr. Visiting Professor of Journalism. The Ottaway Professorship is named for the founder of Ottaway Newspapers Inc., a coast-to-coast group of 13 daily, 11 Sunday and more than 30 weekly newspapers with a total circulation of 387,224. The flagship newspaper of the chain is the Times Herald-Record in Middletown, N.Y. It is the the first endowed professorship in journalism at the university. Read SUNY New Paltz’s press release about Tick Talk here. Suzie Berkowitz-Abbas is a student at the State University of New York at New Paltz. Quinn Patrick O’Callaghan has the luck of the Irish on his side. After some crummy grades and general malaise in high school forced him to attend community college, he turned his life path around when he earned steady writing assignments at About Town, a quarterly in Duchess County, and Hudson Valley Chronicle. It all started when O’Callaghan showed up to the offices of About Town and asked for a job. And whether his bravado wowed his boss or the local quarterly needed more manpower, O’Callaghan ended up reporting from a friend’s van soon after. “It was a pizza-eating, cross-county adventure,” O’Callaghan said. If his life were creative non-fiction, it would be a little bit of everything, like his favorite books (on basketball history, the founding fathers of the U.S. and a novel on which he hasn’t decided yet). Maybe, if O’Callaghan had a movie, it would open with a glimpse of the hobbies that form his determination and easygoing spirit, like O’Callaghan shouting positions during a SUNY New Paltz club lacrosse game, where he is a defensive player. Some Led Zepplin (with a bass track played by O’Callaghan himself, by ear) would guide the viewer into the next scene, a flashback. O’Callaghan praying to St. Olaf, his confirmation saint, hoping the axe-wielding, deceased Norwegian may grant him the courage in his Newsweek internship interview. And then, epic music as he lands the interview. He’s on his way to success. And even though no one knows where the film of his life will end, it seems he just needs to ask for a happy ending. Quinn is now the sports editor for the Red Hook/Hyde Park Observer newspapers and feature writer at Ulster Publishing. John Carey is a man that knows what he wants and is unafraid to go after it. At least, that’s the attitude he adopted when he decided to follow in his father and three younger brothers’ footsteps to pursue medical school. Born in Goshen, NY John came to New Paltz for a well-earned degree in geology as a predecessor to medical school. Though his family followed the conventional medicinal route, John covets a more nutritional and holistic-based degree in Naturopathic medicine. His method of paying for med school? An Army scholarship that subsequently keeps him in shape. When he is not in school, John is an all-in-all family man. He puts spending time with his nieces, nephews and siblings before anything else including his favorite hobbies of hiking and running. When he has time, he may even take up hunting. In 10 years, John fully intends to follow his heart to the city to be a Naturopathic doctor. Of course, only after he serves his time in the Army to pay back for the scholarship that got him through med school. His approach to graduation, he jokes, is a loose one and he plans to remain in New Paltz until at least 2016. April Castillo is a third-year journalism student at the State University of New York at New Paltz. She is a graduate of the American Society of Magazine Editors (ASME) 2013 internship program, where she worked as an editorial intern for Woman’s Day. Her work has been published and featured on Woman’s Day, womansday.com, The Huffington Post, The New Paltz Oracle and The Staten Island Advance. Her specialties include writing, fact checking and researching health, fitness, food, nutrition, science, medicine, healthcare, career advice and business. As a lover of WordPress and all things web-related, she runs a personal blog at Go April Go. When she’s not reminiscing about foodie adventures, she enjoys writing about running half-marathons, health, fitness and nutrition. On the professional end, one of her blog posts for the American Society of Magazine Editors intern blog was spotlighted by the MPA – The Association of Magazine Media. Annemarie Courtens, better known as Annie, is currently studying Sociology and Environmental Studies at SUNY New Paltz and will complete her degree within three years with Honors in May 2015. Her story begins an hour and a half North of New Paltz in Hudson, New York nineteen years ago. Born and raised on an organic vegetable farm, Annie has found herself following in her parent’s Muck-Boot steps. She is the President of the Sustainable Agriculture Club on-campus as well as being involved in many other environmentally focused groups. When she’s not spending nights studying in the Honors Center she’s either in the mountains hiking or skiing, seeing live music or taking spontaneous trips across state lines. She also has a hidden talent for finding four leaf clovers. Annie hopes to one day volunteer with the Peace Corps. Until then, she will spend the summer working on a farm in drought-ridden California and couldn’t be more excited for this new and challenging experience before her last year in college. Kelsey B. Elizabeth is an aspiring writer who found journalism to be a good fit when she started college a few years ago. There is a meaning to it for her and it feels like a worthwhile thing to do. Health and nutrition are the main focus of her work, and she will get a nutritionist certificate to help her write about those topics. She is interning in NYC right now at Good Housekeeping Magazine gaining the skills that make a good writer like research and verification. Having grown up in East Greenwich, Rhode Island, she would like to end up close to home in Boston after she graduates this May from SUNY New Paltz. Or she may stick with an older goal and travel to a Spanish speaking country to write and be able to use the Spanish minor which she is also about to pick up here at the University. If Smaranda Dumitru is not spending time with her family and friends in Queens, New York where she was born and raised, she is gardening in the backyard of her home further upstate in the small town of Blooming Grove. For Smaranda her passion surrounds food and community and working to help change the food system. “Community is centered around food,” she says and for her many problems in the world could be fixed by helping to change the current food system. She is currently a student at SUNY New Paltz studying Journalism however before that she attended SUNY Purchase for Studio Art and Art History. In fact, during her transition between institutions she took time off to work and spend more time upstate where she could work with her hands and go hiking with her cat, Franklin. In May, Smaranda will graduate from SUNY New Paltz and hopes to head South or West where she can find a job working with a non-profit that focuses on community development through local food programs. Her biggest fear is not being able to work or have a job that she loves and is passionate about. Like her cat Franklin, Smaranda is curious and excited to explore the world and take on adventures every chance she can. Laura Jensen will be graduating with Honors from SUNY New Paltz with a Bachelor of Arts Degree in Digital Media Programming and Management in May of 2014. In her spare time she enjoys traveling, spending time with family and learning about different cultures. She has a fond appreciation for international studies, volunteering and writing about topics that strengthen both community and the well-being of society. Having media and journalism experience at NBC Universal and with various non-profits statewide, Laura dreams of one day being a Director of Communications for a non-profit institution. Outspoken, opinionated, satirical. Adjectives that sum up the person that is Zach McGrath. Born in nearby town of Highland, Zach, 28, with a self-proclaimed personality of the element of earth, was attracted to the spirit of New Paltz. He has a son Max, 4, who just started reading. “He’s alive,” Zach jokes about the state of his son. When he’s not taking care of Max, Zach spends his time reading dense philosophical tones- most recently “Zealot.” After seeing the author on The Daily Show, Zach became enthralled in the story of the secular life of Jesus. Even though he has this intellectual side, he appreciates the comedy in life, noting that even Dante felt the need to throw a fart joke into the Inferno. This actor-turned-journalist likes doing research and simplifying it for a wider audience. In the end, writing is his main passion. He appreciates a good political scandal noting that Rob Ford is his spirit animal. Having to start a career and education over from acting to journalism, all with being a single parent, has made Zach a very goal oriented person willing to do whatever it takes to achieve his dreams. Jennifer McGreevey is a third-year student at SUNY New Paltz, originally from Queens, N.Y. She is a journalism major and double minor in evolutionary studies and philosophy who is just about ready to graduate, which she plans to do one semester early in Fall 2014. When she’s not reading or writing, she likes to take walks on the Rail Trail, watch hilariously bad movies, listen to music, and then read and write some more. Jen is a waitress at a local Egyptian restaurant, Moonlight Café, and as a result eats many falafels. She is a member of the Honors Program. Zameena Mejia is a junior in the Honors Program at the State University of New York at New Paltz. She is a double-major in Spanish and Journalism with a concentration in Public Relations. During her Fall 2013 semester, Zameena studied at Universidad Carlos III de Madrid in Spain, and has since completed the Journalism-Public Relations end of her bachelor’s degree. She will use her senior year to focus on Spanish studies, her Honors thesis, and her extracurricular leadership positions. She is an Arts & Entertainment copy editor and writer at SUNY New Paltz’s weekly newspaperThe New Paltz Oracle. She is also the co-president of The BEA Media and Journalism Society at New Paltz. As a New York City native, Zameena is a museum-hopping, concert-going, adventure-seeking traveler, always ready for a new challenge. Hannah Nesich is a fourth-year journalism major at the State University of New Paltz, studying sociology as a minor. She gets her daily doses of journalism through her time as a staffer on The New Paltz Oracle and as an intern at Hudson Valley Magazine. Her writing has been published in The New Paltz Oracle, Hudson Valley Magazine, Times Union, Avant-Garde Magazine and The Little Rebellion. She enjoys long-form journalism that covers culture and politics and one day hopes to professionally write about their cross-section. In her spare time, she enjoys photography, theater, slam poetry, and a charming plethora of high quality, Netflix-flavored television shows. Jen Newman was brought into this world via Mt. Sinai, Long Island 20 years ago. Young Jen dreamed of dancing on point as a prima ballerina, but her mother’s fears of weak feet dashed those hopes early. At the age of 9, her parents divorced and she moved upstate to Middletown. As she grew older, Jen found her niche with writing. As a sophomore, Jen took a creative writing course that opened her world. At the behest of her teacher, she entered her poem “The Pencil” to be published. It was accepted. The path that lay in front of her was clear. Spurred on by her poetic success, she joined her school’s journalism class where she was assigned to the school paper’s sports desk. Soon, she was the editor-in-chief and that helped her decide on attending SUNY New Paltz as a journalism major. As a member of “The Oracle,” New Paltz’s student run paper, she’s learning valuable skills to survive in the journalism world while indulging in her love of TV sci-fi like “Once Upon a Time” and “Supernatural”. Esther Shevel is a student at the State University of New York at New Paltz. Katherine Speller is a journalist, essayist and purveyor of eye-rolling puns who is about to graduate from State University of New York at New Paltz with a very expensive piece of paper. She spends most of her time writing about feminism and media on the internet, projecting human emotions on her pets and watching Biography Channel specials about psychic children. You can find her writing in various nooks and crannies on the internet including: her self-maintained Feminism blog, Feminist Fiction; think piece and essay reservoir, Thought Catalog, and SUNY New Paltz’ independent student newspaper, The New Paltz Oracle. Jordan Wilkinson is an aspiring journalist and essayist with a passion for self deprecating narratives, small-town reporting and anything related to feminism and women’s issues. She is a former intern reporter for The Poughkeepsie Journal, a daily publication located in the Hudson Valley, where she learned to stop talking with her hands while conducting in-person interviews and to spin yearly community theater performances of “The Nutcracker” into readable stories. In her free time she dabbles in freelance writing and fills diaries with the cringe worthy, yet inexplicably sentimental stories of her life. She is an avid distance runner with a penchant for red wine, two hobbies that don’t mix together, yet work perfectly if done in the correct order. To date, her greatest accomplishment has been successfully hiding her cat, Montgomery, from her landlord for the past ten months.